In order to better serve our patients and for the well-being of the community, St. Mary's Hospital Center (SMHC) has performed a study for a development project, which will involve construction on the south and west sides of the hospital. This will include the two following phases: The decongestion of the Emergency Department, in Pavilion A, on the south side (Jean-Brillant Street); The addition of two floors in Pavilion D, on the west side (Légaré Street). To this effect, St. Mary’s Hospital Center offered two information sessions to residents of the neighborhood on March 21, 2011 and March 28, 2011. Additionally, a public consultation meeting was held on April 4, 2011, by the Côte-des-Neiges- Notre-Dame-de-Grâce Borough Council. This is good news for St. Mary's Hospital who have been waiting for the addition of these two floors since 1968. Over all, questions about our project form those who were present at the various sessions were pertinent and the overall the project was very well received. 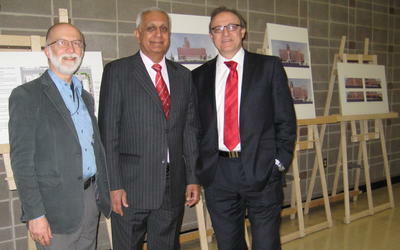 Pictured above, from left to right, Richard Brisson, Director of facilities and Projects Management, Arvind K. Joshi, Director General and Chief Executive Officer and Ralph Dadoun, Vice President of Corporate and Support Services presented the project and answered questions from residents at the SMHC information sessions.